There are many types of horses. Apart from breeds, horses can be classified as light horses, ponies or draft horses. These classifications are based on size, build, and use. Light horses are 14-2 to 17 hands high (hand = 4 inches). These horses are used primarily for riding. The common light horses shown in 4-H and fairs are Quarter horses, Paints, Appaloosas, Arabians, Thoroughbreds and Grade horses. Ponies are horses under 14-2 hands. Ponies are used for riding, pulling carts and pleasure. Draft horses are 14-2 to 17-2 hands, but they are heavier than the light horse group. They can pull heavy loads because of their bulky bodies. Draft horse breeds include Belgians, Clydesdales and Percherons. The two most popular breeds of ponies are Welsh and Shetland. Horses have been an integral part of civilization. Up until the early 1900s, the horse was a primary source of transportation and a source of power for most work. Today horses are used for recreation and pleasure. There are more than 5 million horses in the United States. Horses are used for racing, showing, working and pleasure. As a result of the various needs and preferences of people, many breeds have developed. Each breed emphasizes the desirable traits needed or preferred by the horse owners. Horse breeds have developed on the basis of speed, work, color and showing. For a complete list of breeds go here. Speed was the primary emphasis in the development of the thoroughbred and standard-bred breeds. Both breeds are used almost exclusively for racing; therefore, their criteria for selection is speed. As a result, the thoroughbred has developed into a tall, long-legged horse which can run very fast over long distances. The standard-bred is a horse that races at a trot; therefore, they are selected for their ability to trot extremely fast. Quarter Horses race extensively but their original intent was to be fast in short distances for working cattle. Racing Quarter Horses are practically a breed within the Quarter Horse Association because of their selection for speed. Draft horse breeds emphasize their ability to pull or carry large loads. As a result, the emphasis on size has developed a breed that has very large bulky bodies to enable them to pull heavy loads. Belgians, Clydesdales and Percherons are examples of the draft horse breeds. With the development of power equipment, these breeds have diminished considerably in the last few years. Several breeds were developed strictly for the show ring. These breeds have a variety of body types and each has a different way of moving, based on the show ring emphasis. The four main divisions in the show ring are stock type, hunter type, saddle seat and gaited breeds. Quarter Horses, Paints and Appaloosas fit primarily in the stock horse breed section. However, these breeds show in hunter classes occasionally. Hunters are usually thoroughbred horses. The saddle seat division includes horses with high knee action and more animation in their movement such as walking horses or gaited breeds. The typical saddle seat breeds are Arabians and walking horse crosses such as the National Show Horse breed. Walking horses or gaited horses include Tennessee Walkers, Saddlebreds and Hackney Ponies. All of these breeds emphasize high knee action and animation. Several breeds have developed based on the preference for color. These breeds include Paints, Appaloosas, Pintos and Palominos. Emphasis on color has slowed the improvement of other traits–conformation, speed, etc.–because many matings do not produce color. The most important consideration in selecting horses is quality. There is a wide variation of quality within each of the breeds. You can find both good and bad horses in any breed, so selection for quality is extremely important. The following breeds and associations are important to the Louisiana horse industry. Each breed association has registration forms and rules for registration. If you plan to show a registered horse be sure to get the registration papers transferred at the time of purchase. Horses are athletes. They must be selected on their athletic ability. Three things are important in selecting a horse. They are the horse’s conformation, movement and intelligence. For a horse to be athletic, he must have the body to be an athlete. We call this conformation. He must move well. He must have a good mind to allow him to be trained. Horses are athletes. They must be selected on their athletic ability. Three things are important in selecting a horse. They are the horse’s conformation, movement and intelligence. For a horse to be athletic, he must have the body to be an athlete. We call this conformation. He must move well. He must have a good mind to allow him to be trained. To judge a horse’s conformation, you must know the parts of a horse. Conformation depends on structure, balance, muscle and type. A structurally correct horse has a long, sloping shoulder; short, strong back; long underline; long, level croup; and straight legs. Balance means that each part of the horse is developed in proportion to the other parts of the body. A heavily muscled horse should have a well-developed hind quarter, bulging arm and forearm and well-muscled back. Type is related to muscling and overall size of the horse. For a horse to be an athlete, he must be balanced, muscular and sound. Horses being judged in halter classes are selected on these characteristics. The four characteristics that a judge analyzes when judging a halter class are structural correctness, balance, muscling and type. These characteristics enable the horse to be functional and athletic. The illustration shows the key structural considerations. A horse should have a long, sloping shoulder to have a long stride. (B) The back should be short and straight. (C) A short back enables the horse to carry weight and arch his back for running, stopping and turning. A long hip is important for the horse to have a long stride with his rear legs. (D) If a horse has a long, sloping shoulder, a short back and long hip, he will also have a long underline. The horse’s neck is a counter balance for the horse. The neck should be about one and one-half times the length of the horse’s back. These lengths and angles allow the horse to have a long, smooth stride and make him more athletic. By dropping a line straight down from the point of the shoulders to the foot, you can determine whether the horse is correct on his feet and legs. If the column of bones from the point of the shoulder to the foot is perfectly straight, the stress of the horse’s weight and movement will be uniform in the bone structure and the horse will be able to remain sound. Horses that have crooked legs tend to put more pressure on the bone structure and tendons. Lameness is the result of stress on crooked legs. Therefore, you must select horses with straight legs. The balance of the horse is critical for him to be an athlete. The horse carries two-thirds of his weight on his front legs. Therefore, he must have the proper body angles and lengths to carry weight properly to avoid having excess weight on his front legs. If you were to take a picture of a hose and draw a line straight down through the withers and another line through the point of the hip, ideally the body is divided into Q three equal parts. If the shoulder is long and sloping, the withers are located well into the back, a third of the weight will be in front of the withers. If the back is short and strong, a third of the weight will be in the middle of the body. If the hip is long, a third of the horse’s weight will be directly on the rear legs. As you can see, structural correctness relates to balance. A horse that has a short hip, a long back or a straight shoulder tends to put more weight on the front legs. Excess weight on the front legs reduces balance and athletic potential. Horses that are heavy in their fore-quarters and light behind are poorly balanced regardless of their structure. The object of every horseman is to buy or produce an outstanding horse. Nutrition, training and a nice environment can make a bad horse look good. Therefore, our purpose is to determine the horse’s true genetic potential. The genetic potential is determined by 32 pairs of chromosomes. These chromosomes contain all of the genetic material that determines the quality of the horse. In buying a horse or producing one, try to select horses that have many good genes. All traits in horses are affected by two things, the environment and genetics. You must select for traits that are determined by genetics (highly heritable) to make improvement. Heritability is the percentage of the horse’s characteristics influenced by genetics. For example, a horse’s size is influenced 50 percent by genetics and 50 percent by nutrition. If you are selecting for size, only 50 percent of that trait is influenced by genetics. Most important traits in horses are highly heritable. Traits such as length of stride, conformation and intelligence are 40 percent to 60 percent heritable. Therefore, selecting horses with those traits is effective. Table 1 shows the heritability estimate of several traits of importance in horses. Note that you could expect good progress in selecting for speed or conformational factors. But fertility is not highly heritable, so selection for fertility would not result in much progress, because nutrition, management and diseases have more effect on fertility than does genetics. This is also true of show ring results. For example a western pleasure horse has a certain height, weight, length of stride and conformation that are highly heritable and allow it to move well. However, the show ring performance is influenced more by training than any other factor. Therefore, you would not expect show performance to be highly heritable. Your goal is to select a horse with good genetic potential and then provide the proper environment (nutrition, health and training) to achieve success. When selecting a performance horse, you should use all of the information available to you. For an older horse, the show records will be important. However, with a young horse little information will be available. Three characteristics are important in selecting a performance horse. The first is the horse’s pedigree. The pedigree or ancestry will indicate the horse’s genetic potential to perform. In looking at a pedigree, you must remember that a horse receives one-half of its genetic material from the father and the other half from the mother, so each parent is equally important. Also the horse receives one-fourth of its genetic material from its grandparents. The information beyond the grandparents is practically useless in evaluating a pedigree since only one-eight of the horse’s genetic material comes from its great-grandparents. Each generation, the influence of the parentage is divided in half. The above chart shows the influence of each ancestor. The sire and dam are the most important indicators of potential. You should look at the sire’s and dam’s record to determine genetic potential. A good pedigree does not ensure an outstanding performance horse, but it indicates the genetic potential received from the previous generation. The second characteristic of concern in a performance horse is conformation. Conformation affects the horse’s balance, length of stride and ease of movement. Conformation was discussed in detail in the intermediate project book. Please review that material before evaluating a horse. The third area of concern in a performance horse is movement. The horse obviously should move well to be an outstanding performance horse. There are five characteristics of movement to check when evaluating a horse’s potential. They are (1) length of stride, (2) straightness of stride, (3) flight pattern of the foot, (4) balance of the horse and (5) ease of movement. Measure length of stride by looking where the foot falls occur. A key consideration is the length of stride of the rear legs (Figure 1). A horse carries two-thirds of its weight on its front legs. The longer the stride with the rear legs, the better the horse is able to handle the weight on the front legs. The horse’s rear legs should land on or in front of the track of the front legs when the horse is walking (Figure 1). If the horse strides past the track of the front foot with the rear leg, it will be able to balance its weight better over the rear legs. As a result, it will move better. The horse should also move its legs straight (Figure 2). Have someone lead the horse straight to and away from you to determine how straight the horse moves. Most horses will swing their legs in or out to some extent. Problems occur when they swing their legs close enough together to interfere and cause injury. Horses that have scars on the inside of their ankles or fetlocks probably interfere and have poor potential as performance horses. The third characteristic in evaluating movement is the flight pattern of the leg. 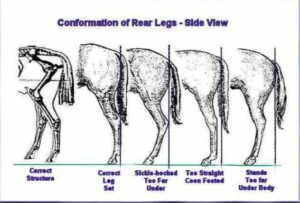 The leg’s flight pattern is different for different types of horses. Generally the horse should have one long continuous arc from the point where the foot leaves the ground to the point where it strikes the ground. The arc should be smooth and round and relatively low. Figure 3 shows flight patterns of several different horses. As shown, some horses pick their feet up very sharply and then have a long smooth straight line putting them down. Others drag the toe and then drop the foot. These two characteristics tend to be typical of horses with straight shoulders. (Conformation and movement are closely related.) In walking horse breeds, the flight of the leg is almost straight up and down. 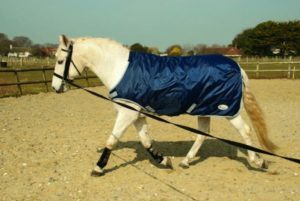 This is desirable for show ring performance but is normally not desirable for riding horses or western-type horses. There fore, the flight pattern of the foot must suit the use and breed of the horse. The fourth method of evaluating a performance horse is to check the horse’s balance while it is moving freely in a pen or pasture. The horse should have a long flowing free stride and should always be on the correct lead. As you watch the horse stop and turn, it should be fluid and balanced, not scrambling and falling. If the horse has a tendency to stop on its front feet, is clumsy in turns, consistently lopes in the wrong lead or is disunited, its balance and coordination are less than desirable. A horse that misses leads and stops on its front legs while running free in the pasture is a poor candidate for most athletic endeavors. The final evaluation of movement is the horse’s ease of movement. Watch the levelness and smoothness of the horse’s topline as it moves. If the horse naturally carries itself well, it will normally move well when ridden. If the horse carries its head in an abnormal position (high, low, nose out or in), teaching the horse to stay in balance will be difficult. Horses will always perform better if the desired response is easy for them to accomplish. Therefore, if it is difficult for the horse to stay in balance, it probably will be poorly balanced. 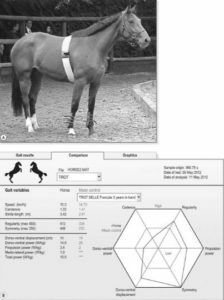 By checking a horse’s pedigree, conformation and movement, you can estimate its potential as a performance horse. The most difficult trait to determine is trainability (mental capacity). You can determine, to a certain extent, the horse’s attitude and quietness by observing it. 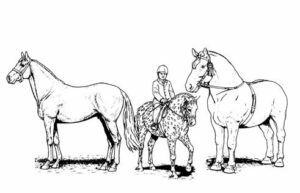 By using all of the available information on the horse and evaluating conformation and movement, you can increase your chances of selecting an outstanding performance horse. I really love horses, too! Greetings from Germany!